Calling all Hammers!! 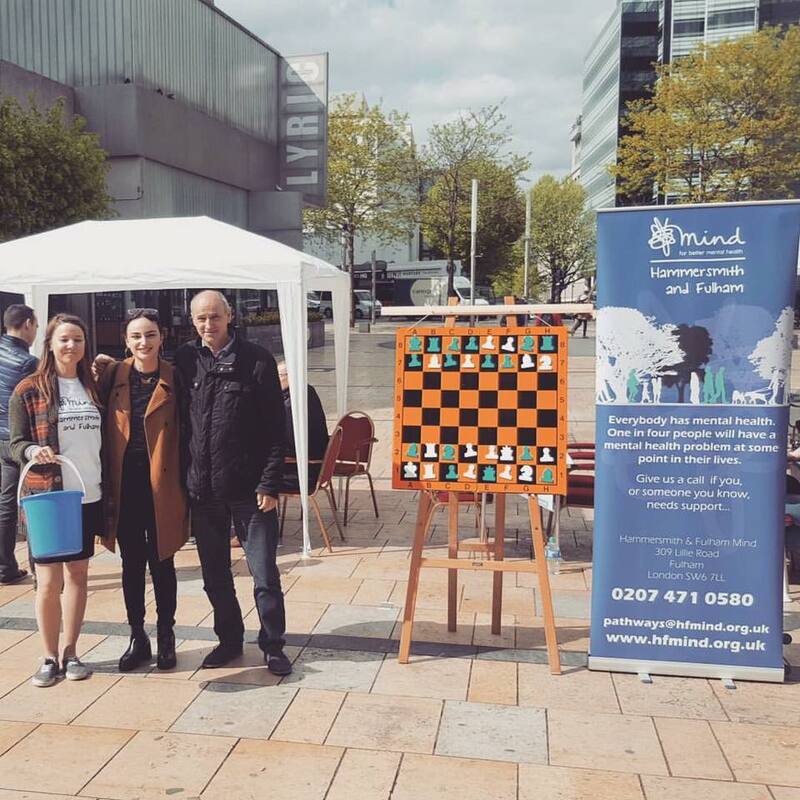 – we need your help on Saturday 19th May as we take chess back to the streets of Hammersmith & help our local branch of MIND raise money for a good cause! 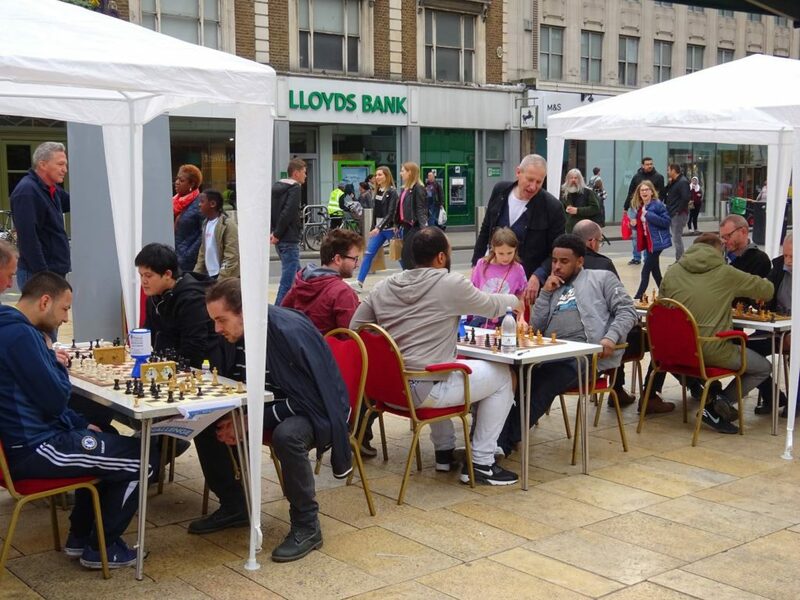 As you may have read this week – we are returning to Lyric Square, W6 next month for a day of chess, activities and fundraising. Your support is critical – and we want to smash this out of the park. It was a massive, massive success when we did this last year, and a brilliant day out for all involved, raising over £400 for MIND. We need help with logistics, leafleting, playing chess, taking contact details & new inquiries, fundraising and much more. Even if you can only spare a few hours between the hours of 9am and 4pm, we will be enormously grateful! We need to know how many of you are willing to help out ASAP – so please get in touch by Friday 4th May, so that we can plan accordingly! 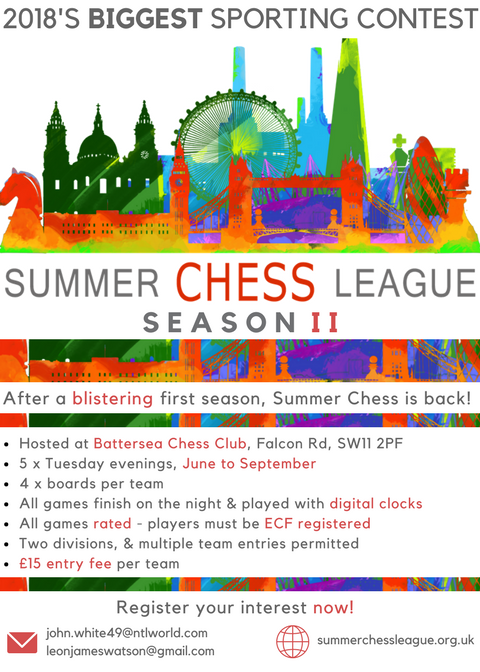 Yes, the rumours are correct… after a truly amazing first season, the Summer Chess League is back for 2018! It’s going to be even bigger & better this year with the number of team entries having doubled from last time – not including the many clubs still to confirm their entries – and Hammer looking to field an additional couple of teams from last time too! We’re also aiming to introduce a divisional structure to help even out the matches & retain the competitiveness. Nevermind the Summer of Love – this will be the Summer of Chess! As with last year, the league will be played over five Tuesday evenings, all at Battersea’s spacious, technologically advanced & beer-fuelled home venue. Final details are still to be confirmed, but rest assured – you will be the first to know! Yes, welcome to the latest instalment of the Starship Hammer 1 and her one year mission to boldly-go to Division 2 of the London League. Partie sept et huit – Starship Hammer has gone into prolonged orbit around the binary planetary system Battersea Chessicus (BC2/3) – the mission, to meet with the noisy neighbours/strange inhabitants of this world. Thankfully, on the whole the people of BC2/3 are overwhelmingly friendly. The question is how would relations between our peoples be after two deadly encounters in over the board chess mortal combat? This latest assignment has been given the code name “El Chessico 2018” and designated as mission critical by Starfleet Command. Captain’s Log – Star Date 10/04/2018 and 17/04/2018. Clueless at the helm. The Hammer 1 voyage has reached a seminal point – successful in this enterprise and we would be in the home straight and prime position to successfully conclude our overall goal. I had much to contemplate with landing crew selection vital in achieving the mission objectives. With the background of unknown diplomatic consequences – as well as two vital chess matches to be won – this was Hammer 1’s severest challenge. The first encounter saw Hammer take on Battersea 2. My report is tempered by the fact I was playing as well. The Hammer 1 crew was greatly depleted, missing the huge talents of Paul (The Prof), Chris (Sydney) and Thomas (T-Bone). Fortunately, willing and very capable deputies were on hand. Marios (Zeus), Bajrush (Wily), Jim (Loco), Tommaso (Forza), Pavel (Spock), Jeremy (Brexit), Paul K (Dead–Eye), Matteo (The Suit), Alexander (He shall be known as the Talent) and Clueless bringing up the rear. Both Forza’s and Brexit’s games are adjourned with the former in the ascendancy where cannot lose but hopefully enough to press for a win. Our Jezza, aka Brexit, is an exchange down but in a very blocked position he seems confident of holding it. The next two boards saw excellent Hammer wins when both Dead-Eye and the debutant Talent, played excellent games. Lastly to Clueless on board 10. This was a case of snatching a draw from the jaws of victory. A nice knight retreat won me the exchange, but then my yo-yo form of this season took over and I failed to prosecute my advantage. So frustrating and particularly as this would have practically guaranteed victory on the night. So, the current score is 4.5-3.5 in Hammer’s favour with two games to be decided. The worst Hammer can do is draw, and even the half a match point we would get, will keep us firmly on course. Obviously, victory by either Forza or Brexit (of the right variety) would be the more desired outcome!! Hammer beamed down again for the second match against Battersea 3, a week later. Again, it was all change as Clueless rung the changes in an effort to score a decisive blow. The Talent and Clueless stood down, and Thomas (T-Bone) and Nadhmi (The Gift) took up the cudgels and prepared to fight for Hammer honour. This was a very different affair with Hammer ending the night at 9-0 up with one game adjourned. An almost Fischer-like performance with a win rush of epic proportions. T-Bone playing white utilised his usual Kings Indian Samisch variation with Q-side castling, sacked a pawn on the queen side and then marched his major pieces to the King side and launched a heavy assault down the g and h-files. In the end the overwhelming forces deployed were just too powerful. The first of the glorious nine was secured. On board two Zeus, in the last game to finish, pressed with the black pieces and went to the limit in striving for a win. I can reveal he has offered his opponent a draw in the adjourned position. We await developments, but for the purposes of this blog I will take it as a draw. Hammer steady at 1.5-0.5 to the good. That was the only respite granted to our opponents with Hammer in devastating form and totally in the groove. Loco at anytime is a formidable opponent. With the hits pieces against a French defence with space advantage and an open file, unstoppable. This was risk-free chess with the capture of a couple of pawns along the way. In the end, resignation was his opponents only viable option. Win number 2. Forza is not only a Caruana doppelgänger, but is starting to play like the WCC Challenger! His style is so smooth with his classic idiosyncrasy of taking about 80% of his allowed time over the first fifteen moves. He then speeds up and moves in for the kill. He always seeks to take his opponent out of normal lines and forcing them to rely on their talent rather than memory. This is a deadly skill. Facing a Scandinavian response to his initial e4 he found a variation that forced his opponent to start thinking from about move 4. Forza then launched a pawn storm against the black king on the Q-side, that was so powerful, it led to a swift and fully-merited win. Spock scored his win through forceful and dynamic play. he trapped the white king int he centre and then netted a rook for a bishop. His opponent was clearly demoralised and overlooked a tactic that would have ended in mate or the giving up of the second rook. 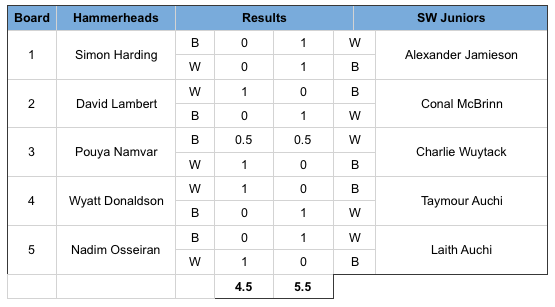 An excellent performance – Hammer soaring at 5.5-0.5 to the good. Next up was Brexit. He set a clever trap that saw his opponent surrender his queen for rook and minor piece. The rest of the game saw consolidation and mopping-up in full flow. A real Brexit job and almost welcome victory. The last two Hammer gauchos could not wait to join the landslide party. A hugely impressive night by the Hammer Crew. A result that will not be forgotten for a long time by our noisy – but excellent – neighbours. Clueless is reaching zen level – inner peace is within touching distance. My thanks and congratulations to the Hammer heroes who really grabbed the moment in both matches. Four games to go until mission end and Hammer are in charge of their own destiny. Next up are Albany on the 30th April and Clueless will be mailing out shortly. Hammer 1 are the new definition of Mean Machine. An ecstatic Clueless over & out! Puzzle of the Week #016, & Bonus Match Report! Admittedly, it has been slightly longer than a week since our last round, but who’s counting! Our master-quiz-setter Carsten noted, “It was really just an excuse to plug the Dutch author Tim Krabbe’s fantastic chess page. Forged the dated labour and lack of presentation, the content is probably the best of any chess site on the net. 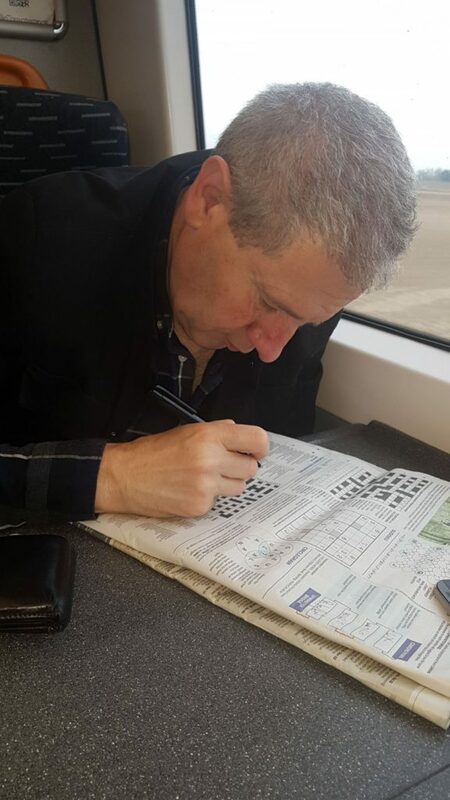 While Carsten & Co. concoct some more fiendish puzzles, we bring you a writeup by our Correspondent of the Year 2018 of last week’s London Div 5 game. Enjoy! Welcome to Charlie Sturt, who debuts this season for our Division 5 team, but has already campaigned in other leagues. This match started off with our small team being in the middle third of the league. Comes to the penultimate match of the season and we’re in the bottom quarter. So it is with much relief that I can report a great win, almost a slam dunk, with a 3-1 score over Lewisham. Read on for the unexpectedly good news. Our opponents, losing the toss, meant we were White on odd boards. I was preoccupied with my game and so saw little of anyone else’s game, so their commentary has been included here. On board one, Nadhmi (as White) was up against a seasoned veteran looking for revenge after a previous defeat, and things looked very tough for Nadhmi in this game. Early on Black sacrificed a bishop for a pawn to attack White’s castled king. Black then forked White’s king and a rook with a knight. White however persevered and, fortifying his centre, was able to get counterplea against Black, who had not castled. Nadhmi started swapping of pieces and pawns. The end was inevitable, with king, knight and pawn against a king alone. Black resigned after the pawn was queened. 2-0 to Hammersmith. On board three, the captain looked like he was getting into trouble after fumbling against an obscure defence, 1.e4 d6, known as the Pirc. But as the middle game progressed, he was having a slight advantage, since he had a strong knight at d5, and Black had issues with king safety. White sacrificed a bishop for two pawns and White was doing fine, albeit 20 minutes down on the clock. The first deadline came and went, with about even clock times. All queens and rooks were present, but Black had two stymied bishops facing a mere knight. White continued blocking Black attempts to free his pieces. Finally, after White lost a pawn by mistake in the centre, Black started to push the e and f-pawns to the 5th. White was strategically lost. In the dying last two minutes, Black suddenly sacked his queen for the c3 pawn, protected by White’s queen, but the White queen was guarding the back row square b1 against checkmate, so couldn’t take the Black queen. White found a rook check, instead – but White, realising his mistake, reflected on the correct check. Yes, the sacrificial Black queen on c3 could in fact be taken (QxQ+! ), with check on h7, and Black would have lost. 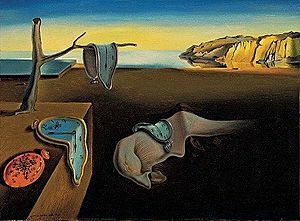 White was so chagrined, he’d had enough, and the flag on his clock cruelly dropped. So much for strategy, blunders quickly settled it! Author HammerPosted on April 18, 2018 Categories Club Updates, Games, Team CaptainsLeave a comment on Puzzle of the Week #016, & Bonus Match Report! The Hammer train never stops, and none more so than this week. We’ve got a great set of updates for you to read through – it’s a long one, so make sure you read all the way to the bottom! Thames Valley Cup – One Win From Glory! First up, in some superb BREAKING NEWS this week, we are delighted to report that our Thames Valley team superbly navigated their Semi-Final against Richmond this week, winning 3.5-2.5 to make it through to the FINAL of the Cup Competition!! 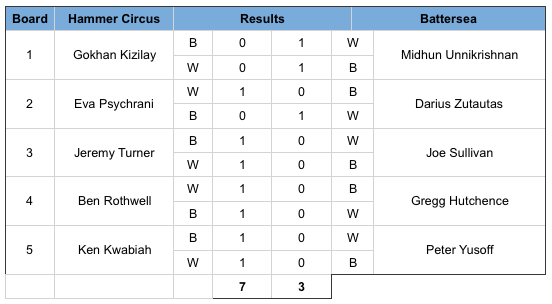 This is a superb achievement – it’s a brutal knockout competition with no second-legs, so it really is a case of putting everything on the line each round. Massive congratulations must go to Captain Bajrush and the rest of the squad for this marvellous achievement. 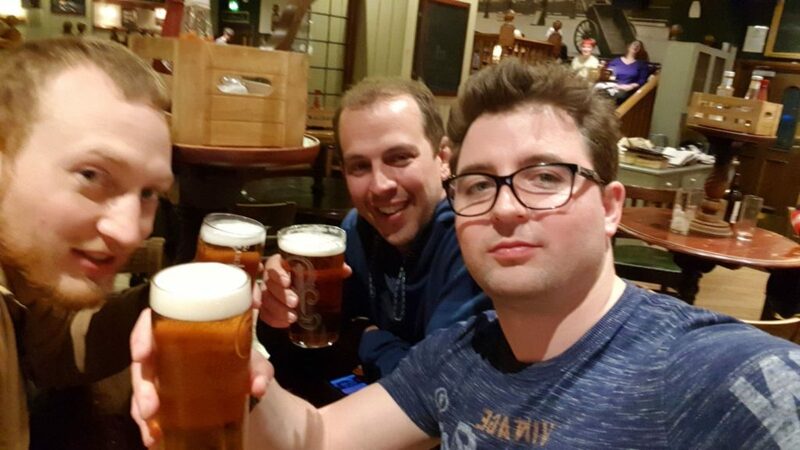 Hammerites toasting the superb Semi-Final result earlier this week! We’ll be facing the titans of Harrow, or Kingston in the final – full details to follow. It promises to be an absolute CRACKER! The Hammersmith League contestants once again do battle at the Anvil. The first round had seen some blood-thirsty encounters as well as some subtle positional efforts. What would the second round reveal about the teams and their captains? A dramatic night once again unfolded… I invite you to read on. The first of these encounters saw two teams who had experienced very different results in round one. Battersea had negotiated a very tricky encounter with the SW. The Circus had a bruising encounter with their fellow Hammerites – the ferocious sounding Hammerheads. In a full-blooded encounter they went down 8-2 with only Captain Ben preventing the dreaded double-bagel scoreline of 5-0 and 5-0. They needed to bounce back hard if they were to have any chance of fighting for the title. I think when the chips are down and your back is against the wall, then the Hammer characteristics of tenacity and sheer grit shine through. We do not go quietly into the night. To the match – this is a real tale of blood and guts. No draws. All results decisive. Gokhan had a tough task on board one and tried his best, but he was taking on a 194 and sadly for his team, it was too much of an ask. However, this was the only blip in an otherwise excellent performance by the Circus team. The tale of the tape was seven victories and just a solitary defeat. The Circus Crew are back in the mix! The second game saw the SW Juniors take on the in-form Hammerheads. Confidence was high in the Hammerhead camp, especially after their thrashing of the Circus in round one. Alexander again starred, and is now on 100% for the tourney, although he had to rescue two inferior positions against Simon. I felt sorry for Simon because he deserved better from the chess he produced. Caissa can be cruel! Dave suffered a bit of a debacle in the first game with Connal but was back to his best in the second leg and won in good style. Pouya had a little too much experience for Charlie and won their mini-match 1.5-0.5. This one was definitely down to experience and an older, wiser head. Wyatt overwhelmed Taymour in the first game and confidence was high for the return encounter. However, these Juniors do not get down. When they lose, they just shrug it off, and come back twice as hard. Taymour played an excellent game and earned a well-merited revenge win. 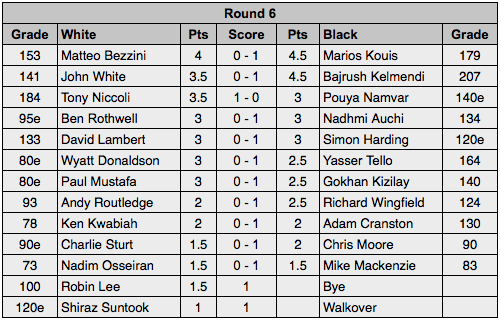 In the final lineup Nadim and Laith shared the points with some unbelievable blunder and counter-blunder sequences mixed in with some excellent chess. The SW Juniors had come through a tough examination and not only demonstrated chess acumen way beyond their years, but also a grit and resolve that is uncommon in ones so young. They will become even more formidable chess players in the future, is the only conclusion this correspondent can come to. So, it is all change in the League table and again there is all to play for in the next and FINAL round, with three teams in the running for the title of Champions. Tune in for the next instalment!! In the absolute avalanche of matches and events in February, this important new item got missed! 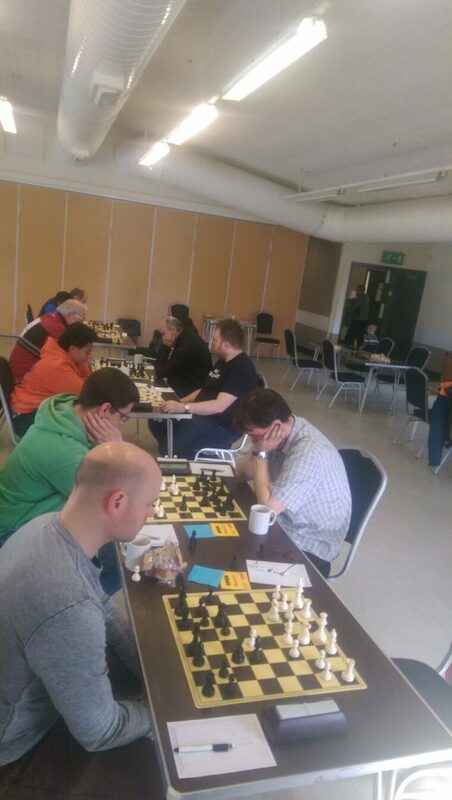 The second round of our internal blitz tourney took place on the 12th February at the Anvil. This is a quick update on the events of that evening. Twenty-three Hammerites and one guest turned up for the second leg of our tri-tourney series to contest and vie for the title of Hammer Blitz Tourney Champion. One of the largest turnouts in the modern version of this event. Superbly organised by Club Captain Adam, we were divided into four groups for the all-play-all section. The qualifiers from the groups were: Thomas, Charlie, Carsten, Alexander, Bajrush, Mohammed (a guest for the evening), Tony and your reporter John W.
The knock-out secant saw Thomas, Carsten, Bajrush and Tony, who respectively beat Charlie, Alexander, Mohammed and John W.
The big-four had made it through to the semi-finals. In a throw-back to yesterday the two semi-finals yielded Bajrush and Carsten as the winners. A definite case of deja vous! God knows how many blitz games these two stalwarts of the club have contested over the years! The critical significance would be if Bajrush triumphed, he would have sealed the title with one round to go. However, Caissa took a hand and Carsten took the win and kept the destiny of the 2017-18 Hammer Blitz Champion still up for grabs. A great night of blitz and lots of congratulations to all who took part. All this means that there is still all to play for!! Remember, it is your two best scores that count – so roll on the final leg after our AGM on the 4th June. All Hammer make a note! Yes, the Hammer Crew were off on their travels and using the old excuse of a ‘chess challenge’ as cover for excessive beer consumption. The chess part of this tale came about by pure chance. 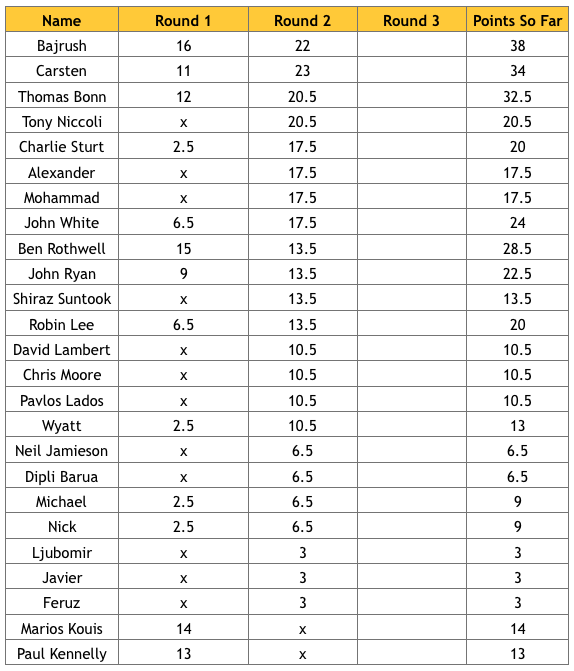 Paul Mustafa, one of our new members, had entered the Bury St Edmunds Chess Congress, and the organiser – Steve Lovell – contacted me to discuss what his estimated grade should be so he could be entered in the correct competition. During the course of a series of emails, your correspondent chucked in the idea of a challenge match sometime in 2018. Steve responded positively and matters escalated from there. 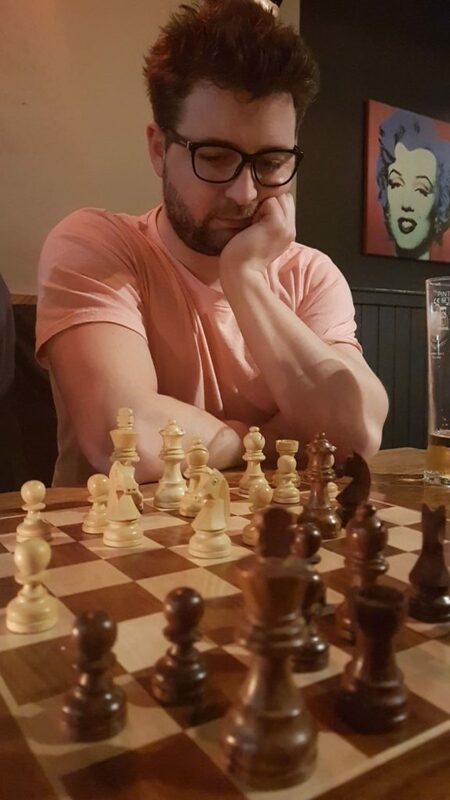 The date, format and venue were set and agreed – the Hammer Crew were taking on the powerhouse of Suffolk chess. First, I must acknowledge the work and effort put in by Steve and the Bury St Edmunds club, who were most welcoming and hospitable. They really put the boat out for us and I am very grateful. Steve is not only a first-class bloke, but is possessed of a fantastically calm temperament. Despite me having three late withdrawals he did not throw a fit but just kept calm & carried on! 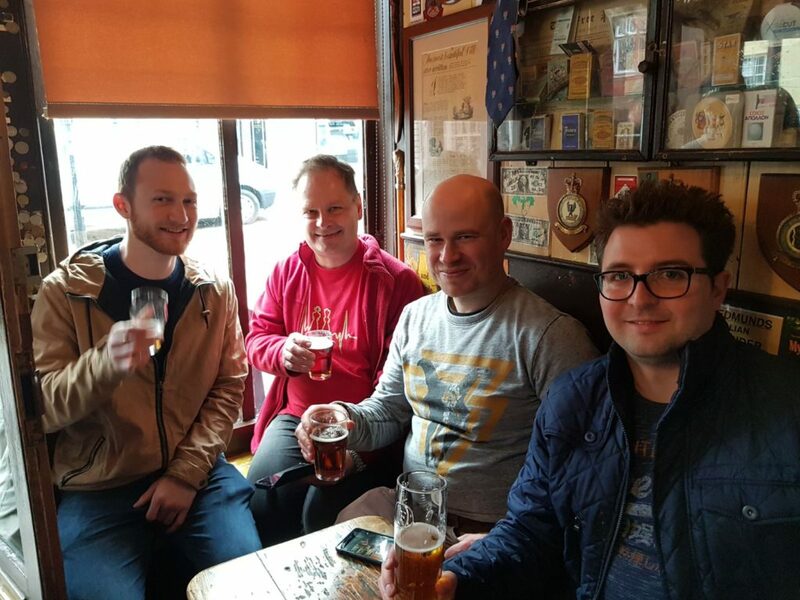 What follows is the story of a chess challenge match, but it was so much more than that – it was about Hammer camaraderie, new friendships and beer. The weekend started early Friday with the tale of Hammerites in three cities: London, Bury St.Edmunds and Cambridge. The London crew consisted of Bajrush and Alex, who travelled up early Saturday for the match. Two of our new guys – Wyatt and Charlie – spent an excellent Friday night in Bury St. Edmunds. 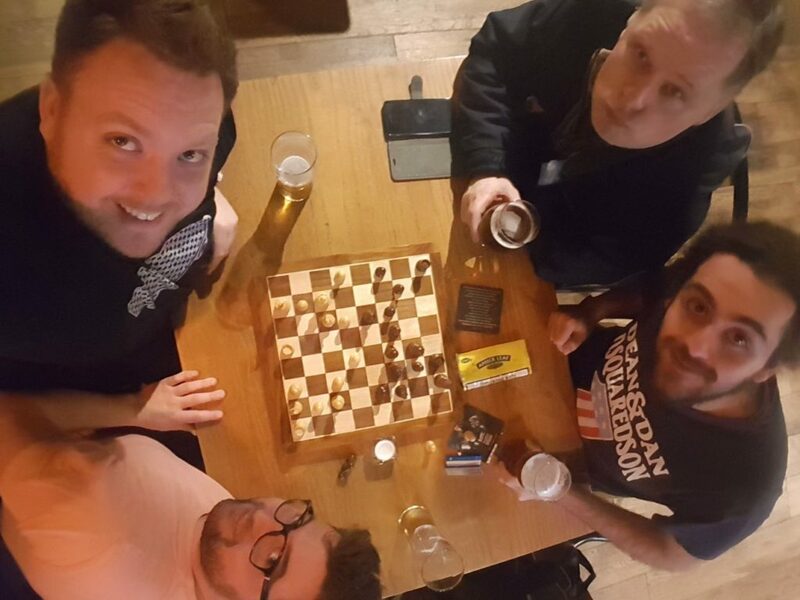 Whilst the Cambridge party Friday night mob consisted of some of the worst elements in Hammer Chess history – namely Carsten, Chris Skulte, Adam and Clueless. 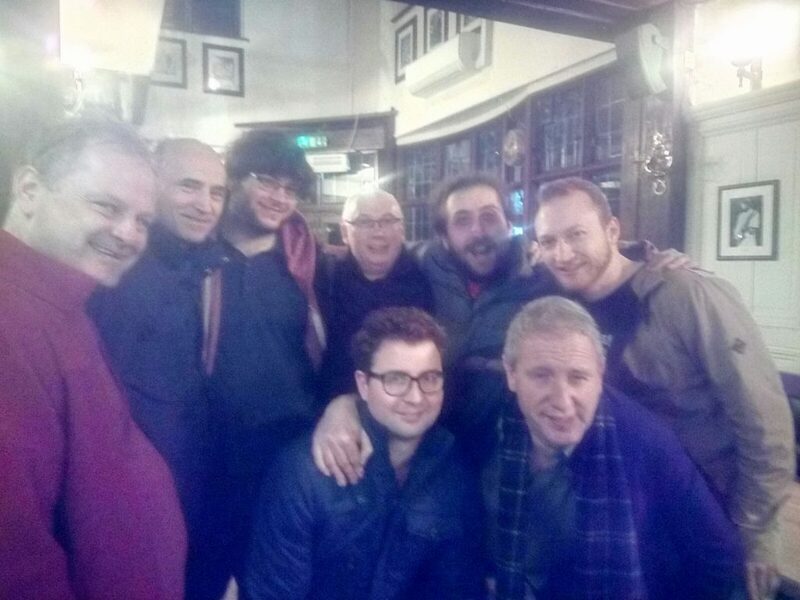 They were joined by another reprobate called Ryszard fora night of beer and curry. 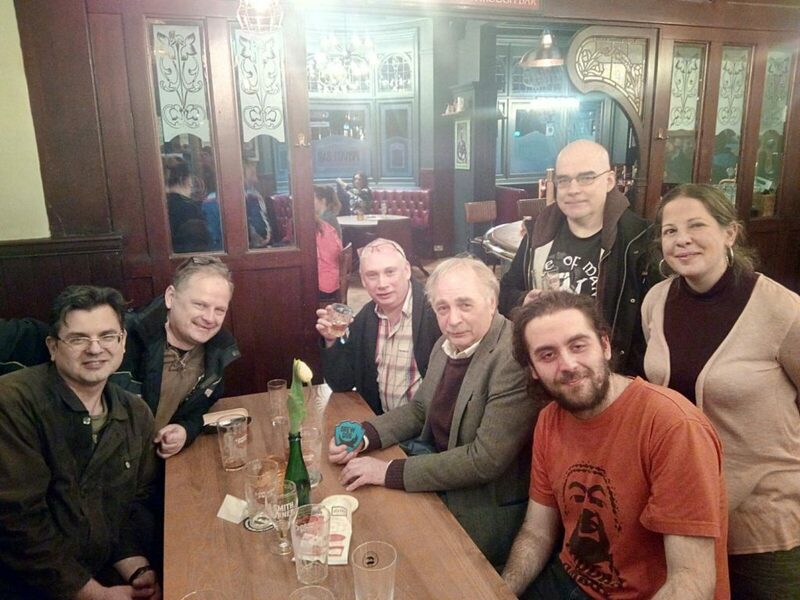 For once I am proud to put my name to the events of that evening – yes, the John White Drinking Club (c) was officially out. The guys were out on the town. For those beer aficionados, Cambridge has an excellent array of watering holes. Chris and Clueless joined the party late afternoon. Our leader for the night was the Great Dane himself – King of Knowledge and Chess Wisdom – the one and only Carsten. But, most importantly for our purposes, a genius at finding excellent pubs to drink in. The fact he had been drinking since midday testifies not only to his love of beer, but his redoubtable stamina. 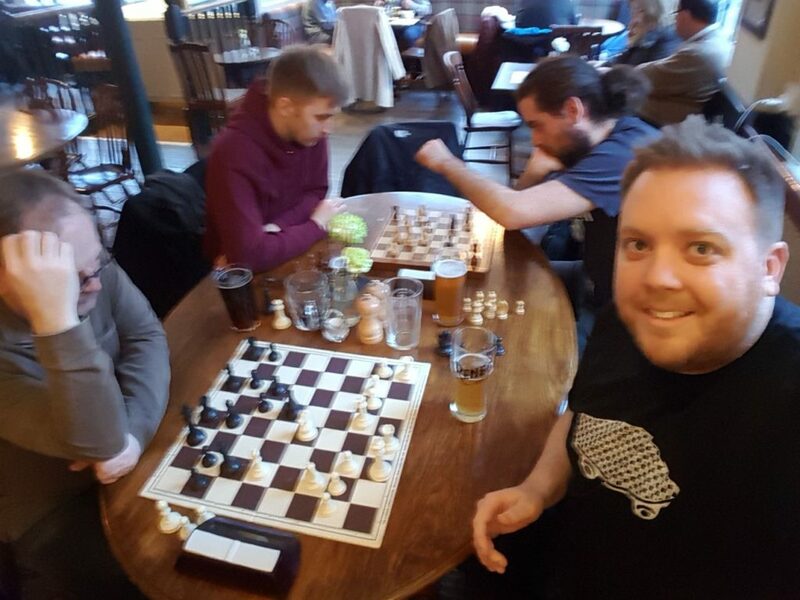 We played a bit of chess and drank a couple of pints at the Kingston Arms. This was followed by a visit to the superb Calverley’s brewery and finishing up at the Cambridge Blue. 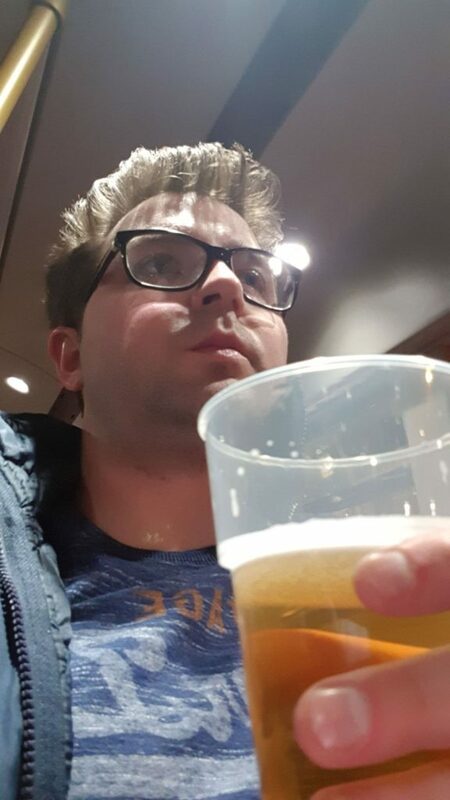 The quality of beer was top-drawer and the company sensational. Finally, just before 11pm, Carsten departed and the survivors found a curry house. I have to confess, the rest of the night was a total blank – I have no memory of getting to my hotel. All in all, a great night and perfect training for our chess challenge the next day. 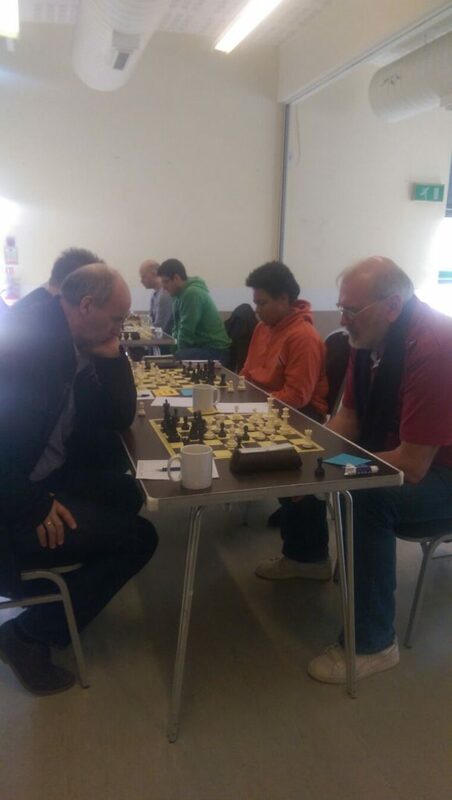 By foot, bicycle, train and automobile, the Hammer team assembled at the Moreton Community Hall in Bury St. Edmunds to defend the honour of Hammersmith Chess Club. We were greeted by Steve and the rest of their team with decent coffee and tea supplies on hand (accepted most gracefully the semi-hungover Hammerites!). Steve gave an excellent greeting speech and explained the days activities and rules. 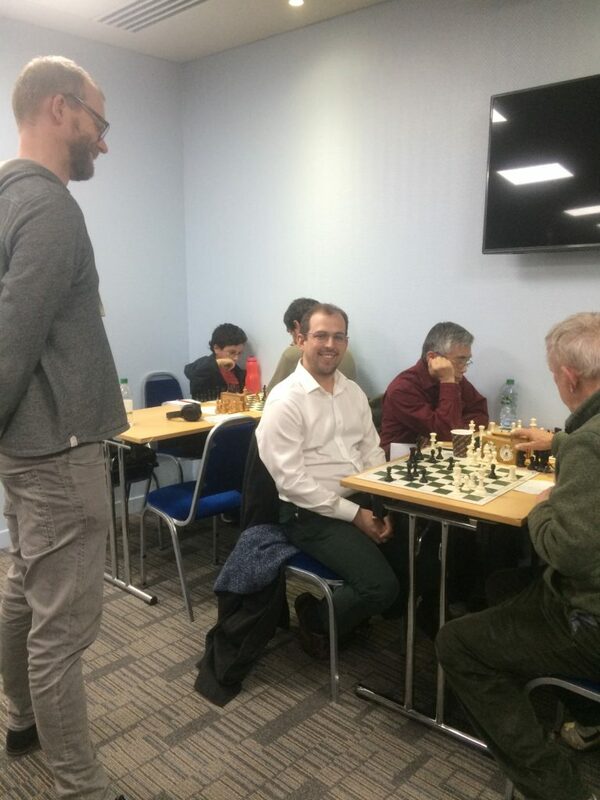 Clueless responded in kind and presented each of the Bury players with a Knight lapel pin, and put on the display the Hammer Chess Challenge Trophy – the prize for the winning team. The long play time control was 36 moves in 80 minutes, plus 15 minutes, with a 15 sec increment per move. The niceties were done & dusted, and the challenge began. There then followed three quick results consisting of two Hammer wins and a draw. Gandalf won nicely, netting a piece on the way and keeping everything under control. Cola also played a really nice game where in the end he was just one move short for victory. His opponent got a perpetual and the point was shared. It was great to see Alex back playing for Hammer and in a long-play format. Hammer secured the match when Ryszard (Breslau) finished strongly after being under pressure during the first half of the game, but a neat combination allowed him to net a rook and the point. A brilliant debut performance for Hammer. The final two games saw Carsten triumph when his opponent was flagged. However, The Great Dane was a pawn up and the only possible winner. It was an excellent performance by Carsten and his opponent Ed was a very gracious loser. Adam’s game was the last to finish and his game would grace any collection of thematic study games. His opponent Steve Lovell, tried everything to win but Adam was resolute in his defence. The rare finish of just a white knight and rook versus a black king and knight was the result. Steve tried hard to win but Adam held fast and did not allow his knight and king to be separated. The draw was agreed after numerous moves. So, the final score was a Hammer win by 7-2 in what proved to be a thoroughly enjoyable and friendly contest. The original club was founded in the 1860’s – it is nearly 100 years older than Hammer! And perhaps best of all, Laurie himself was born at Queen Charlotte Hospital in Hammersmith. I always knew there was a connection between our clubs. The afternoon was a frenetic affair with Alex and Ryszard opting out. It was really fun with Steve doing his best to pair a Bury and Hammer player in the early rounds. In the end, as per usual, the Hammer blitz champion Wily surged to victory – overcoming all before him. The frustrating thing for me was I was a piece up against him and still contrived to lose! He really is Mr Blitz. The day finished with both clubs enjoying the delights of the Nutshell (the smallest pub in the whole of the UK) and the Old Cannon Brewery. The drink and the chat were all good and we departed our new friends late into the night. There was many a tired but happy Hammer who made it home. Once again, I must thank Steve, Laurie and all at Bury St Edmunds – they are a superb club and I look forward to inviting them to a challenge match next year at The Anvil. All I can say is Bring it on! Finally, a quick advertisement for the beautiful town of Bury St Edmunds. A stunning Suffolk town steeped in history and culture. If you have not been there, it is definitely worth a visit. 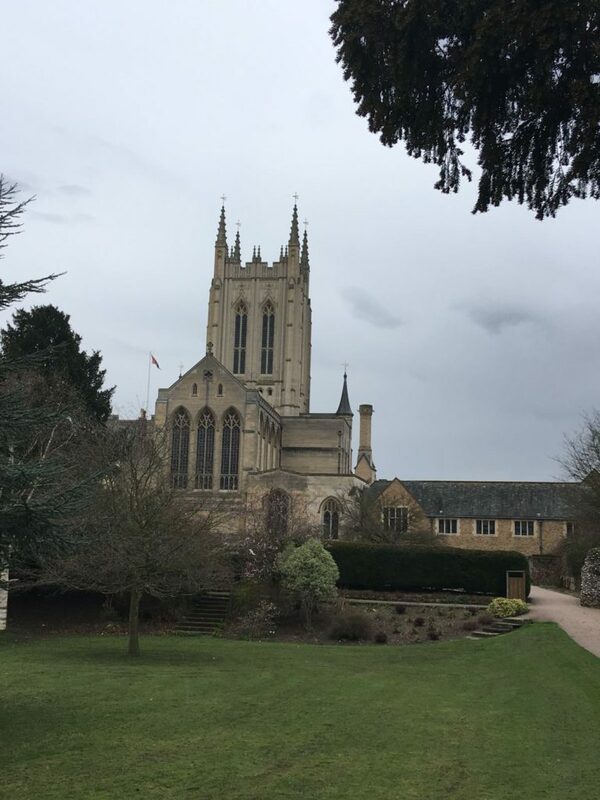 Beautiful Bury St Edmunds – breathe it in! Clueless over and out, and yet again in rehab….! The fifty-six year old history of Hammersmith Chess Club is both rich and varied. In our halcyon days, one of the most important competitions the club ran was the Hammersmith League. This was a long-play format that involved local clubs, but it sadly fell into decline and finally ceased, as the fortunes of chess clubs in West London withered. It was always the desire of the current Committee when the club was reinvigorated and financially sound, to resurrect the League. The big question was how we could make it different to what is currently out there, and give it a modern, relevant twist. The answer lay in the rapid grade you can now obtain as an ECF member. There was nothing out there – League wise – that would allow members to attain a rating – plus the idea that this should be an exclusive competition for players graded around 100. I must acknowledge at this stage the help from Leon and Gregg at Battersea, Tony at SW Juniors and Adam our Club Captain, in realising the new League. Plus, due to helping out our Thames Valley team on the night, Tony Niccoli ran the first evening for me… hugely appreciated. So, Hammer needed two new captains – and I am happy to report both Wyatt and Ben stepped up to the plate. We were ready to go! 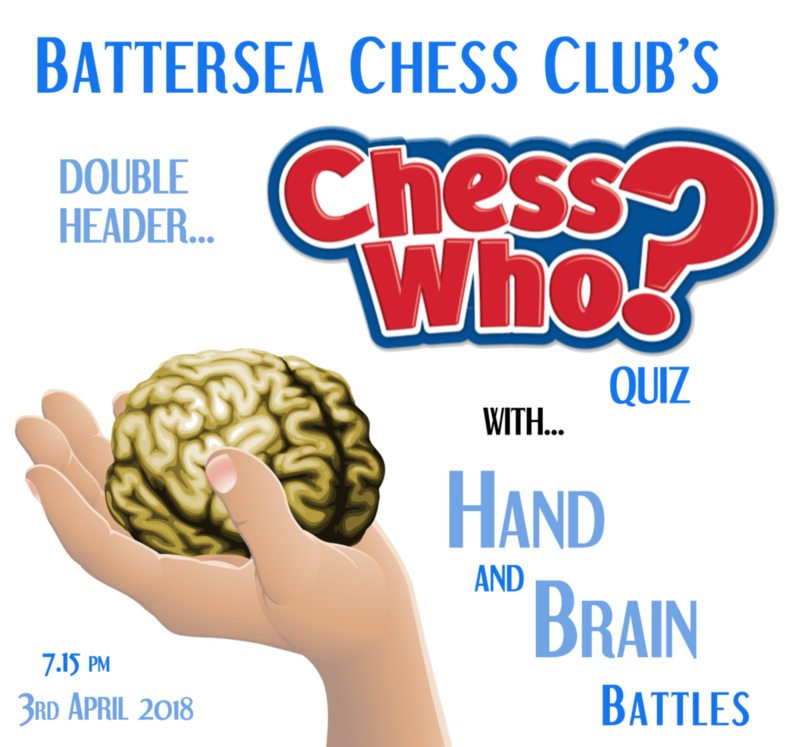 The first round draw saw Battersea take on SW Juniors and the Hammerheads (Team Wyatt) take on their compatriots Hammersmith Circus (Team Ben). The SW Juniors was a tense affair that went back and forth across the two matches. In the end it finished 5-5 and honours even. Notable performances were seen from SW Junior stars Alexander Jamieson and Taylor Auchi, both convincing winners at 2-0. 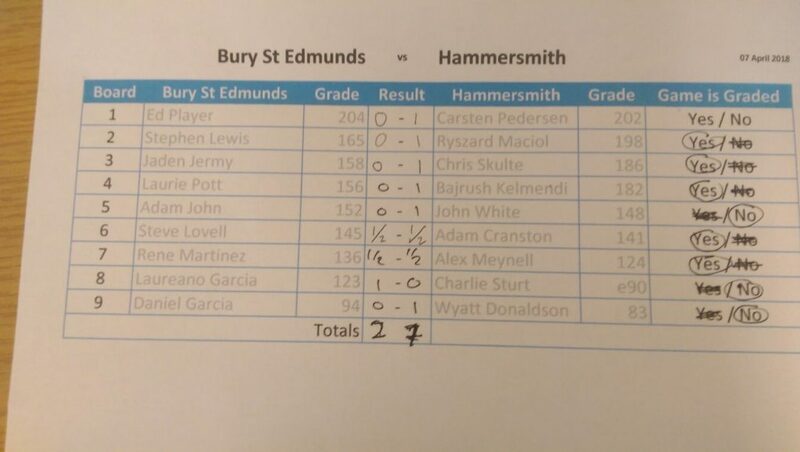 Whilst Battersea stars Josef-Milne-Lewer and Joe Sullivan returned 2-0 victories as well. The Hammersmith derby match now took centre stage. Two new teams and two new captains. There is nothing like lording it over your fellow club mate. There was pride, bragging rights and a bit of putting-in-your-place on the line. Truth be told it was a bit one-sided with the Hammerheads demonstrating a ferocious appetite for points. Worthy of certain Premier League champions elect. The Hammerheads triumphing 8-2 and surging to the top of the table. Their top four boards completing 2-0 sweeps and only Captain Ben heroically holding the line and preventing a whitewash. Game 1 (Dave as Black) – we both fianchettoed King-side and then a bit of a standoff occurred in the middle until I grabbed the initiative with my e7-e5 pawn push. This ultimately left me a pawn up after I threatened a cheapshot mate with a Queen/Bishop battery, forcing Alex on the defensive. Alex also got himself into time trouble as he persistently forgot to press the clock! As we entered an endgame slightly favourable to me, he timed out. Game 2 (Dave as White) – Alex defended with an unusual variation of the Petrov defence which allowed an exchange of Queen and minor piece each, but at the expense of damaging Black’s pawn structure. Perhaps somewhat prematurely, I raided forwards with a Rook which snagged a pawn at the expense of wasting several moves finding a safe square to retreat it to. I entered an endgame with the slight edge but significantly down on time. It was soon a Knight and several pawns apiece, but White had the better centralised King which proved crucial as we entered the final minute. 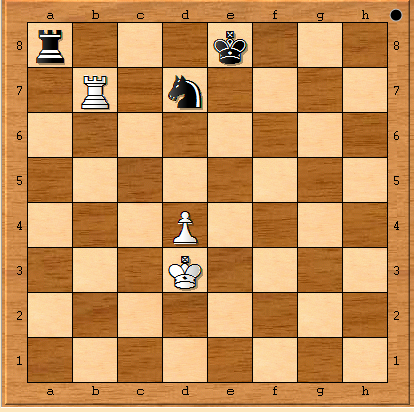 The Black King eventually ended up with two masters – preventing the pawn promotion and guarding his Kingside pawns. It was too much to bear or take, and Alex’s resignation followed very quickly. That is Round One folks, with more to come. There is still all to play for and some crucial, crunch games to come. Bring on Round 2! John. The team travelled to Muswell Hill’s brand new pub venue knowing that this game would make or break our season. The game was just as important for our opponents, and as with most second teams at this stage of the season, both teams were slightly weakened by ineligibility. Go Hammer! The victory means the team is all but guaranteed promotion with a game to spare! The remaining permutations are mind-boggling. 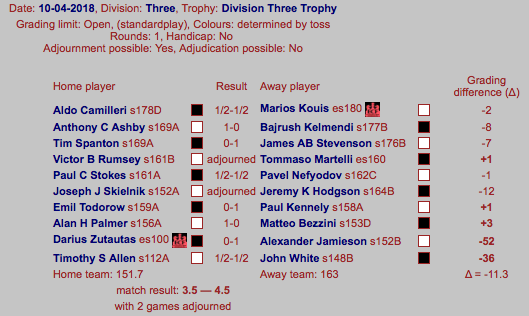 In short, Willesden have to still to play Hendon, and Muswell Hill have still to play Kings Head (twice), so only one of each pair could possibly reach eight points. Even in this rare scenario, and even if we lose our last game, we’d still have a strong chance of promotion based on game points, penalty points, or the league that no club can have three teams in a division. A huge thanks to all 24 players who have contributed to the team thus far this season. The coveted MVP certificate is being hotly contested by Charlie, Ken, Ben, Simon and John. If any of these players win in our 12th match (and the other four don’t), the prize will be his! 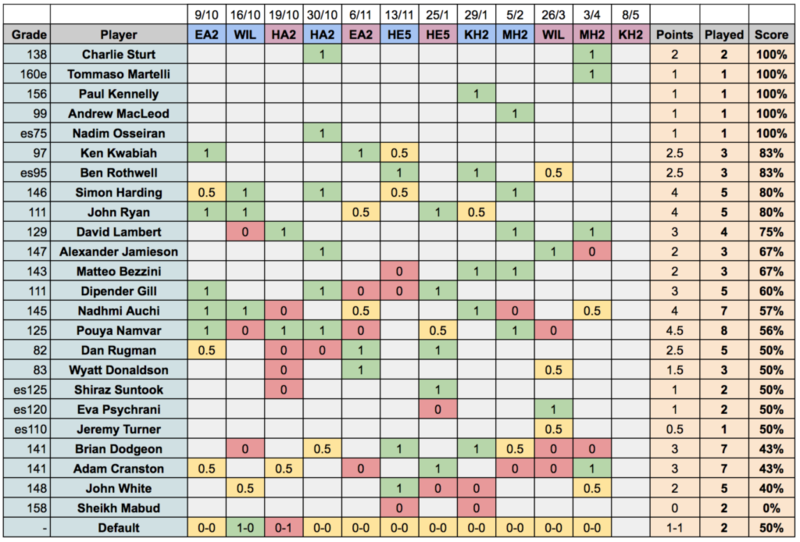 We are definitely approaching the business end of the competition now, with even matchups every week and games generally going to form. There’s still plenty of jostling for position & honours to be done though! 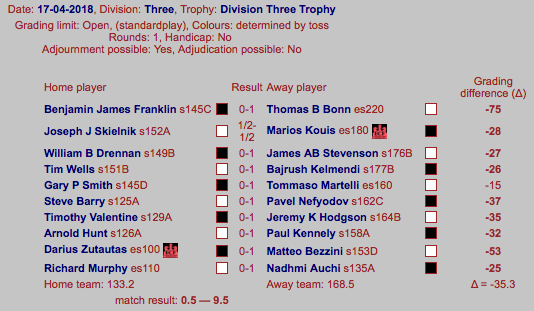 All but one of the Round VI games were won with the black pieces – highly unusual! 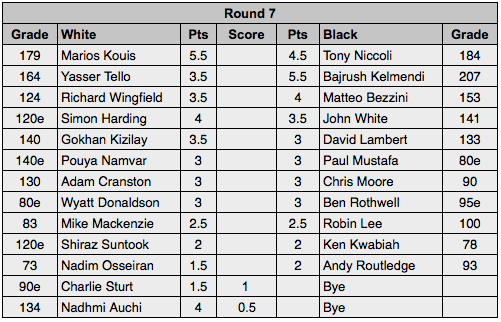 There were sadly no huge upsets this time, with Bajrush and Marios extending their lead at the top, and Simon justifying his 146 January grade with a good win over Dave Lambert. The penultimate round offers up some juicy pairings – not least the Battle of the Hammer League Captains – two in-form players, Wyatt v Ben. Please contact your opponents ASAP and arrange a suitable time to play, and let the tournament controllers know the result before the end of the month.